Live bait fishing in Key West gives you the best opportunity at getting fish to the boat. 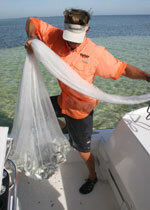 We start the day by cast netting live bait or catching them on light hook and tackle. We keep these baits alive in a live well on the boat until we get to the fishing grounds. After anchoring up or locating our fishing spot, we hook the bait and let it swim while throwing other baits out to free swim and cause commotion in the water. This brings up many different fish to the surface to feed. Light tackle fishing in Key West has to be one of the most exciting types of fishing for anglers of all abilities and all ages. Your fishing trip offshore here in Key West can be relaxed and include some fishing and a fabulous boat ride to a far away beach or a trip offshore for rod bending action that won’t stop until the bait runs out. Fishing on the reefs and wrecks is a lot of fun too. Most of the fish that dwell on the reefs and wrecks are edible and include yellowtail, grouper, other snapper, jacks, cobia and pompano. Some of the deeper structures hold tuna, wahoo and kingfish. Some of the most professional light tackle captains in Key West fish out of our home port at Murray Marina on Stock Island.